On October 16, 2002, the Holy Father declared the Year 2003 (the 25th year of his pontificate) as the Year of the Most Holy Rosary. 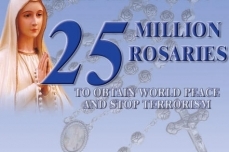 Follow his directive and help us collect 25,000,000 Rosaries. Use the enclosed Rosary pledge form to collect as many Rosary pledges as you can. Mail it back to us and we will send you a free gift for every completed form. 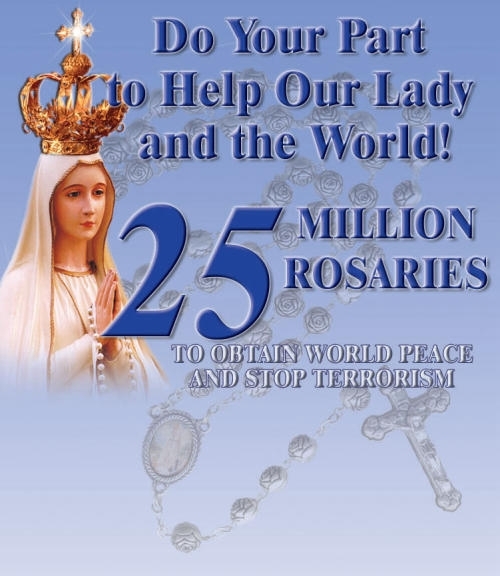 I am prepared to offer ( ) decades of the Rosary daily with the intention of winning for the Holy Father those graces he will need to finally solemnly and publicly consecrate specifically Russia, with all the bishops of the Church, to the Immaculate Heart of Mary. Please copy and forward this sacrifice for Jesus and Mary to us at The Fatima Crusader (see addresses above) so we can place it on the altar before the Pilgrim Virgin statue solemnly blessed by Pope Paul VI.